Looking for full size Joan of Arc sword. Please let me know if you know where to purchase or have one for sale. erm, a bit vague there, I suspect. "joan of arc sword" is something likely to be used by about 1,001 different swords from almost as many manufacturers, probably closely challenging Charlemagne and William Wallace in the over-use stakes. and on top of that, is the question a "I want to buy from a store", or "I want to have made..."? I'm assuming you're looking for advice and reccommendations, and the more information, the more details possible, I'm sure more relevant replies can be made. I hope that's a fair reply. Obviously, we cannot be certain if the sword illustrated is "her" sword, or just a long sword that the clerk felt would be appropriate for the image. Even so, it's by far the best we've got. That being the case, in my mind, the best reproduction sword available to fulfill this role is Albion Armorer's Next Generation Agincourt: http://www.albion-swords.com/swords/albion/ne...rt-xv.htm. If you wanted to customize it to make it a bit more like the sword in the drawing, you could request a peen block from Albion, and perhaps consider switching the guard with the one seen on the Ringeck or Fiore, although personally, I think the Agincourt one works just fine. 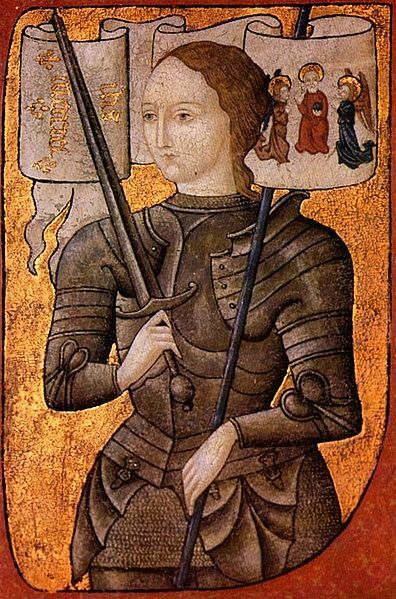 Here is a 15th century depiction of Joan of Arc. I'm not saying that the sword is a painting of the actual one she used, but it could have been something very similar. and here's the one from the Musée de Dijon attributed to her. interesting peice, with an unusual hilt for the blade typography. Joan of Arc's sword was called the "Sword of St. Catherin" and had five crosses on the blade, according to Catholic lore. She had found it in a room behind the alter of a church. The sword she started with was found under the floor behind the altar of the church of Sainte Catherine de Fierbois. She did not retrieve it herself; when offered a sword, she said where the one she would use would be found, and an armorer (think weapons, not armour; back in the day, someone who did what I do was called a 'platemaker', not an 'armourer') was sent from Tours to see if it was where she said it was. It had been buried for a long time. After the siege of Paris, the Fierbois sword disappeared. She would never say what happened to it. From that point on she used a sword she had captured from a Burgundian. P.S. Roger, I have it on good authority (Olivier Bouzy, who was director of the Jeanne d'Arc Center in Orleans) that the picture you posted is a 19th century fake. I was relieved when he told me that; the armour made no sense to me.